Employee performance in the company is strongly influenced by compensation and leadership. This study aims to determine: (1) how the effect of compensation on employee performance at PT. 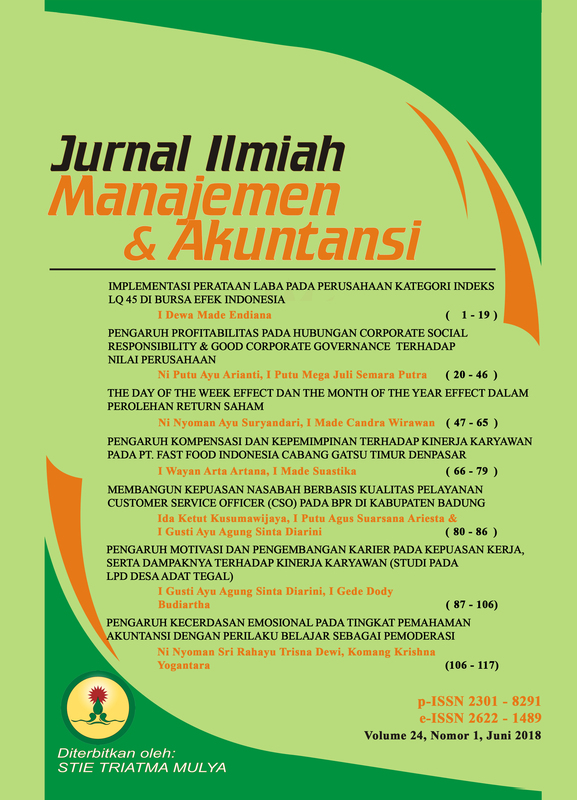 Fast Food Indonesia Cabang Gatsu Timur Denpasar, (2) how the influence of leadership on employee performance in PT. Fast Food Indonesia Cabang Gatsu Timur Denpasar, (3) how the influence of compensation and leadership on employee performance at PT. Fast Food Indonesia Cabang Gatsu Timur Denpasar. This research is a survey research with quantitative approach. The sample in this research is employees at PT. Fast Food Indonesia Cabang Gatsu Timur Denpasar amounted to 38 people with census techniques. Data were collected by using questionnaire while data analysis was done by using multiple linear regression analysis. The results showed the regression equation: Y = -14,479 + 0,595X1 + 0,385X2. The regression equation obtained shows that: (1) there is positive and significant influence of compensation (X1) on employee performance, (2) there is no positive and significant influence of leadership (X2) on employee performance, and (3) there is positive influence of compensation and leadership on employee performance at PT. Fast Food Indonesia Cabang Gatsu Timur Denpasar. ARTANA, I Wayan Arta; SUASTIKA, I Made. PENGARUH KOMPENSASI DAN KEPEMIMPINAN TERHADAP KINERJA KARYAWAN PADA PT. FAST FOOD INDONESIA CABANG GATSU TIMUR DENPASAR. Sekolah Tinggi Ilmu (STIE) Ekonomi Triatma Mulya, [S.l. ], v. 24, n. 1, p. 66 - 79, july 2018. ISSN 2622-1489. Available at: <http://triatmamulya.ejurnal.info/index.php/triatmamulya/article/view/103>. Date accessed: 21 apr. 2019.